LOS ANGELES, Dec. 18 2000 -- Toddling home on the heels of a triumphant trip to Paris, Nickelodeon's Rugrats don't just kick off a new season of rug-up adventures on Monday, January 15 (8 p.m. ET/PT), they wiggle toward an amazing milestone with a new playmate. Rugrats in Paris' Kimi (voiced by Dionne Quan) makes her TV debut in the season premiere, and the diapered tots turn 10 in 2001 amid yearlong hoopla. A season packed with programming events ensues with a six-hour Rugrats marathon (2-8 p.m. ET/PT) capped off by the season premiere. In addition, the new season's episodes, which will air on Saturdays (7:30 p.m. ET/PT), feature a new opening title sequence for the first time since Rugrats hit the airwaves in August 1991. The updated sequence showcases the full cast of babies frolicking, including the newest arrivals, Kimi, Dil and Susie, and an energized arrangement of the show's theme music. ``During the past decade, 'Rugrats' has evolved from a ratings powerhouse, being the number one children's show on TV, to pop icon status. And it has secured a place in the hearts of both kids and adults, who see it from their own point of view,'' says Cyma Zarghami, Executive Vice President and General Manager of Nickelodeon. Fresh from their second big-screen venture, the babies get to know Chuckie Finster's new stepsister Kimi and her mom Kira (voiced by Julia Kato) -- who they met in Rugrats in Paris -- on home ground. In the season opener titled Finsterella, Angelica plants seeds of doubt and fear in Chuckie's mind about his future with a new stepmother and stepsister, and he dreams about a ghastly fate in which he works his fingers to the bone, catering to Angelica and Kimi's every whim, while the other babies get ready for a lavish[, yet wonderful and poignant] soiree... in which Kira and Charles celebrate the adoption of each other's child. Rugrats' celebratory programming events will continue throughout February and March with telecasts of every episode of the series. Viewers will be invited to rate them online at nick.com, and their 10 all-time favorites ultimately will air in a marathon preceding the Nickelodeon Kids' Choice Awards in April. Since premiering in 1991, Rugrats has emerged as a TV phenomenon and three-time Emmy Award winner. The show's classic animated characters offer a broad audience base appeal, creating an enormous following of kids and adults alike. Rugrats finished its fourth straight year as the highest rated kids program on broadcast and cable. In addition, it has been the highest rated kids show on cable seven straight years and is the highest rated property among all kids programs for both Boys 2-11 and Girls 2-11. The most watched program on Nickelodeon, Rugrats reaches a total of 26.7 million viewers each week. This includes 14.7 million Kids 2-11, 3.2 million Teens 12-17, and 8.8 million Adults 18+. In addition, Rugrats is seen internationally in over 75 countries. In November of 1998, the diapered tots made their feature film debut in The Rugrats Movie, which took the nation by storm by earning the top box office gross during its opening weekend. This winter, they headed overseas on a terrific new journey in Rugrats in Paris: The Movie, another box-office smash from Paramount Pictures and Nickelodeon Movies, which has earned more than $60 million domestically to date. LOS ANGELES, Apr 13, 2001 -- A decade has flown by in a burp and a hiccup since Nickelodeon's "Rugrats" debuted, and as the perennial babies scurry toward their milestone 10th anniversary this year, they'll fill a tall programming order with April's "Rugrats" marathon. Moreover, they'll grow to unprecedented heights above rug level in July's one-hour, primetime anniversary special, when the time-travelling tots will be tweens for a day. "As the 'Rugrats' turn 10, it is clear they are in a category all their own. Seven years as the top-rated kids' show proves that this unique property has staying power like no other," says Cyma Zarghami, Executive Vice President and General Manager of Nickelodeon. "Rugrats'" yearlong celebratory programming events [included] telecasts of every episode of the series ever produced... from January 1 - March 31 -- and a special anniversary marathon of viewers' all-time 10 favorites[, chosen by an online poll, on] Saturday, April 21 (4:30-8 p.m. ET/PT). The celebration climaxes with the hour-long primetime special on Saturday, July 21 [at 8PM ET], in which the diapered tots travel 10 years into the "foocher" with Tommy's time machine and become "tweens" for a day. Audiences will have a one-time-only glimpse above and beyond the playpen at Angelica, Chuckie, Tommy and the whole gang, as they prepare to attend their first concert. A home video titled "Decade in Diapers" -- "Rugrats'" 10th Anniversary Collector's Edition featuring kids' 10 favorite episodes -- will be available in stores this summer individually or as a two-volume boxed set with a companion book version of the fantasy episode, "All Growed Up". In addition, a third home video will feature the "All Growed Up" episode. Left & Right: 2 different covers of the August 2001 Nickelodeon Magazine -- subscriber edition (left) and newsstand edition (right); ©2001 Viacom. Top: Banner ad for Pepsi's "FunWrap Factory", from Nick.Com; ©2001 Pepsico. The August issue of Nickelodeon Magazine featured the tweenage versions of Chuckie, Angelica & Tommy on the cover, surrounded by pictures of the more-familiar toddler Rugrats. Inside the magazine, you'll find a poster that features 282 characters from the TV series and the movies, all of them appearing in episodes produced through 2001. Can you name them all? And can you spot the character that appeared twice in this poster? To view a larger image of this big picture, click here. Top: The big Rugrats poster, from the August 2001 Nick Magazine; ©2001 Viacom. Also inside is a can wrap featuring the Rugrats, with details on how to make your own (this is part of an ad for Pepsi). Finally, the newsstand edition will have a special lenticular card on the cover, where you can see the toddler Rugrats magically become the tweenage Rugrats (this card also available separately by mail from Nick Magazine, for US$1.50 each). Finally, this issue is perfect bound, rather than staple bound. Because of all these extras, the cover price for this issue is more expensive than previous issues -- US$4.95, C$5.95 in Canada. Above: Four different Rugrats covers in the 7/21/2001 TV Guide, © 2001 TV Guide, Inc. Rugrats characters © Viacom. Nick Magazine isn't the only place to find the Rugrats on the cover -- TV Guide is also featuring five (yes, five) Rugrats covers in the 7/21/2001 issue. For details, click here. Nick gave away a total of 1000 special Rugrats T-shirts, 100 every night for 10 nights, during the 8PM ET programming from Wednesday 7/11 to Friday 7/20. These T-shirts, available only through this special giveaway, have the toddler Rugrats on front and the tweenage Rugrats on back, and can be had by calling a toll-free number. For those who still like one, you can buy your own shirt exclusively at Nick.Com. 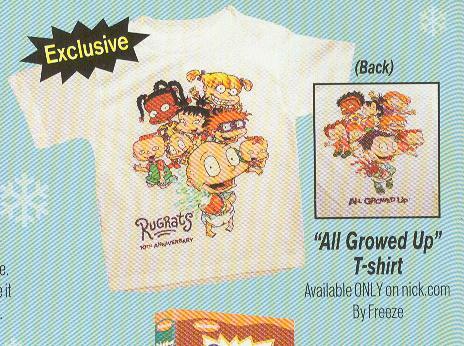 Left: The Rugrats' 10th Anniversary shirt; from an ad supplement in the December 2001 Nickelodeon Magazine ; ©2001 Viacom. Finally, a special documentary, Still Babies After All These Years, was presented on Nick on 7/21 at 9PM ET, following All Growed Up; this special will look into how the episode is made, including clips from favorite episodes and talks with the voices and the producers. Nickelodeon and Nick.com create the first interactive TV / online game experience for kids when BubbleCast debuts February , 2001. BubbleCast is the first online game designed for kids to play on their computers as they watch Nickelodeon TV shows. Available exclusively at Nick.com, BubbleCast will premiere on-air and online during Rugrats at 4 p.m. (ET / PT), which airs weekdays within the network's popular afternoon programming block, Slime Time Live. In order to play BubbleCast, kids will tune into Slime Time Live, where host Dave Aizer will ask kids to log onto a special BubbleCast area of Nick.com. Once logged on, kids will enter a virtual room with up to seven other competitors. While kids watch the Rugrats, the computer will prompt kids with a bubbling sound, and will ask "live" questions in real-time about what's happening on the TV show. At the end of the game, the names of the top 20 BubbleCast winners will be broadcast on Slime Time Live. The BubbleCast promotion ended in June 2001. NEW YORK, Nov. 21 2000 -- In an unprecedented deal marking the importance of kids' influences on family vacation destinations, Embassy Suites Hotels has contracted with Nickelodeon for a three-year, $20 million advertising and promotions agreement starting in May 2001. The announcement was made by James Perry, vice president - sales and business development for Nickelodeon, and Mark Snyder, senior vice president - brand management for Embassy Suites Hotels. Embassy Suites Hotels' decision to team up with Nickelodeon can be attributed to the fact that children play a major role in influencing family decisions. More than 40% of all adult purchases (over $150 billion) are influenced by children, according to a study by Penn, Shoen & Berland. The study also found that 95% of kids can name at least one hotel chain. Sixty-five percent prefer staying at a specific hotel and 56% believe their parents take their opinions of hotels seriously. The agreement between Embassy Suites Hotels and Nickelodeon includes: a co-branded summer promotion and a sweepstakes promotion during 2001; and three co-branded promotions each year during 2002 and 2003 supporting Nickelodeon programming. Embassy Suites Hotels will advertise its kid-friendly amenities and services on Nickelodeon and both parties will create point-of-entry and point-of-sale materials to support joint promotions. The first co-branded initiative kicking off in the summer of 2001 is Embassy Suites Hotels' summer retail promotion geared towards families, which will feature a Nickelodeon theme, including Rugrats games and merchandise. To help celebrate the 10th Anniversary of the Rugrats television show, each family will receive a Nickelodeon premium offering upon check-in at an Embassy Suites Hotel. Embassy Suites Hotels' Nickelodeon-themed Rugrats promotion will be supported on air on Nickelodeon as well as other print cable and broadcast outlets targeted to adults. MEMPHIS, Tenn., May 31 2001 /PRNewswire/ -- Reservations are heating up for Nickelodeon Summer Trip Pack weekends at Embassy Suites Hotels, thepremier hotel brand of upscale, all-suite properties, for stays beginning June 1 through September 16. Families staying Friday, Saturday or Sunday night at any of more than 150 participating Embassy Suites Hotels in the continental United States will receive a Nickelodeon-themed premium at check-in, included in the suite rate. Reservations for the Nickelodeon package can be made through 1-800-EMBASSY or by visiting http://www.embassysuites.com/ and must be made in advance. When making reservations, ask for "Nickelodeon Summer Trip Pack". MEMPHIS, Tenn., July 23 2001 /PRNewswire/ -- Embassy Suites Hotels®, the national brand of upscale, all-suite hotels, has teamed up with Nickelodeon®, the number one entertainment brand for kids, to offer children the chance of a lifetime with its "Be In The Rugrats" sweepstakes. From now through Aug. 31 at participating Embassy Suites Hotels throughout the United States, children between the ages of five and 15 can enter to win a five-day/four-night trip to Los Angeles for the winning family. During the winner's trip to L.A., the winner will have the chance to meet the creators of the Rugrats and be animated for a promotional three-minute Rugrats mini-movie. In addition, the winning family will stay at an Embassy Suites Hotel in Los Angeles and receive Rugrats toys. The Rugrats creative team will study the winner -- the child's mannerisms, laugh, smile and walk -- in order to create a character for the animated movie that not only looks but also acts like the child. to be entered into the Rugrats Sweepstakes. "Be in the Rugrats Sweepstakes"
"As part of our three-year marketing agreement with Nickelodeon, it was a natural fit for us to partner with Nickelodeon in the "Be In The Rugrats Sweepstakes", said Mark Snyder, senior vice president, brand management, Embassy Suites Hotels. "We've had tremendous success this summer with our Nick Summer Trip Packs and have enjoyed working with Nickelodeon to create this sweepstakes. This is just another way we are reaching out to our young customers to show them that Embassy Suites Hotels are fun places." "We're delighted to be teaming up with Embassy Suites Hotels on this fun 'Be in the Rugrats' sweepstakes, especially timely as we celebrate the Rugrats' 10th Anniversary," said Pam Kaufman, senior vice president, promotions marketing, Nickelodeon. "Kids love the Rugrats and we are excited to give them this unique opportunity to get a behind-the-scenes look at its animation and actually become part of a Rugrats mini-movie." MIAMI, Jan. 11 /PRNewswire/ -- Burger King Corporation starts off the New Year with an adventurous climb up a fun-filled tree house with the Rugrats. Based on the highly successful Rugrats TV show on Nickelodeon, the Rugrats Tree House promotion will be exclusively available at participating BURGER KING restaurants in the U.S., Canada and English-speaking Caribbean islands. Beginning on January 15, 2001, the promotion will feature all the favorite Rugrats characters. The eight high-quality themed toys can be enjoyed individually or connected together to create a 17-inch "towering" tree house -- the tallest fully assembled premium ever offered in a kid's meal! The promotion is scheduled to run through February 11th, or while supplies last. "The Rugrats are currently the number one rated cartoon show on kids' television, entertaining over 21 million weekly viewers, and 2001 will mark the Rugrats' 10th anniversary," said Richard Taylor, vice president of marketing for Burger King Corporation. "Having been on top for ten years with no signs of slowing down, the Rugrats property has become a youth entertainment standard. We are very excited about celebrating Nickelodeon's success with the Rugrats through this promotion." Two toys will be available each week throughout the promotion for kids to begin "construction" on their Rugrats tree house. Each individual toy provides plenty of playtime fun and nearly any combination of toys can be used to build a smaller version of the tree house. When all eight toys are collected, they can be assembled to create the ultimate, 17-inch tall tree house. The series of eight high-quality toys, inspired by the beloved Rugrats characters, will be available with the purchase of a BURGER KING BIG KIDS MEAL or Kids Meal. In celebration of the Rugrats anniversary and the introduction of Kimi, a new Rugrats character to the TV show, Nickelodeon will host an on-air "Rugrats Tree House" Sweepstakes. Entry forms for the sweepstakes will be packaged with each BURGER KING Rugrats Tree House premium. Nickelodeon will build the winner their very own dream tree house in their home or backyard. The BURGER KING promotion will be supported with national kid-directed television advertising, which will break on January 15th. The spots were created by Lowe Lintas & Partners. In-restaurant merchandising has also been created to support the promotion. For details on the new toys, click here. It should be noted that Burger King has no special promotions planned during the summer of 2001 (to my knowledge) around the Rugrats' 10th anniversary -- they already had a Nick-oriented promotion in June 2001 with SpongeBob SquarePants, and during July, they have a special promotion surrounding the movie Jurassic Park 3. Mattel is... the master toy licensee for Nickelodeon's Rugrats, who are celebrating their 10th Anniversary in 2001. To commemorate the event, in Fall 2001 Mattel will launch a 10th Anniversary gift set. New from Mattel in Spring 2001 are the Totally Angelica Deluxe Dolls that allow young girls to give Angelica a complete makeover or dress her up with jewels. The assortment includes two fashion dolls collections: Beauty Boutique that lets girls give Angelica an ultimate day of luxury at her own spa, and Fashion Jewels that lets girls prepare Angelica for a big party as they decorate her outfit and hair with colorful jewels and beads. In Fall 2001, Mattel will launch Angelica's RC Chatmobile and Susie's RC Chatmobile, Rugrats remote controlled cars with original phrases and sounds that correspond to the movement of the cars. Also in Fall, Mattel will introduce Angelica's Sassy Styles, a new feature doll with "wig recognition," that actually has Angelica responding to one of the three stylish wigs that girls place on her head!